Do weight loss apps really help people lose weight? Americans have long struggled with obesity. According to the National Institute of Diabetes and Digestive and Kidney Diseases, a division of the National Institutes of Health, in 2010, 74% of American men and 64% of American women were either overweight or obese. This number has been multiplied by more than two since 1962, a fact that leads many to label this trend as being an epidemic, the cure for which is unclear on a large scale. On a much smaller scale, people can choose to use diet and exercise to lose weight. Many people consider this to be a goal they are currently pursuing. It’s something that always comes up in conversations about New Years resolutions, especially ones that people quickly abandon by January. But why do people have such trouble with this concept? It should be just a simple process of eating less calories than you need to function. But sometimes this is difficult, as it is hard to tell how many calories are in each specific foods, or even how many are needed for daily functionality, which is why many people turn to fad diets that promise quick results. Some people choose to go the traditional route, however, and in the digital age, there are several apps that can help people in doing this. Apps such as MyFitnessPal allow users to input the foods they eat into the app, which will in turn calculate what foods are highest in calories, and total their calories for the day. This is to help users keep track of how many calories they need to cut to lose weight. That is, it’s supposed to in theory. But does it really? A study was recently conducted figure out if these apps had effect made on the weight lost by young people. The study was conducted as a randomized control trial of adults aged 18-35, who were deemed suitable for the study if they were considered obese or overweight and had a cellphone. From this criteria, the researchers were able to obtain the participation of 365 people, who were broken down into three groups. The first of these groups was the group using the weight loss app to help keep track of the calories they consumed. The second group was given access to personal coaches that would give the students recommendations on what kinds of foods to eat, and help them stay on track in their weight loss goals. These coaches would perform a similar function to the apps, but with the difference being in that they were able to create a human dialogue with the participants about their weight loss, a dialogue that the app could not reproduce. The third and final group was the control group. Each group had an approximately equal population, at 120-123 people. 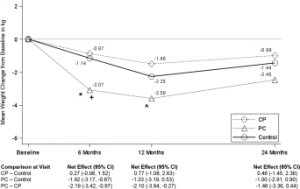 The null hypothesis of this study would be that weight loss apps do not contribute to the successful loss of bodyweight The alternative hypothesis of the study, however, would be that weight loss apps do in fact contribute to the successful loss of body weight. Each of the three groups was measured in their weight at the begining of the study, and then again at 6 months, 12 months, and 24 months. 86% of participants responded al the way until the end of the study, making the end result mostly representative of the original sample. At 24 months, the subjects who had access to the personal coaches, designated as PC on the graph above, has lost an average of 2.45 kilograms. The control group had lost an average of 1.44 kilograms, and the users of the weight loss app, designated on the graph as CP, lost an average of .99 kilograms. The conclusion of the study would be forced to accept the null hypothesis of the study, that weight loss apps do not contribute to the successful loss of weight. The data supports this hypothesis, as those using the app lost less weight than even the control group, who had no guidance on how to lose the weight. This data makes sense when one considers how these apps work. Users have to input the foods they eat manually, and then the app calculates how many calories are in each food. This could prove to be inaccurate, however, as users may not input a specific enough food, or the correct amount of servings, causing the app to calculate a different amount of calories than they actually consumed. These incorrect calorie counts could lull users into a false sense of security, fooling them into thinking that they can eat more than they actually should. In short, the app could suffer from user errors, causing calories to reported incorrectly. The false sense of security provided by inaccurate calorie counts is probably what caused the app users to lose even less than the control group. With a personal counselor, these kind of errors are a little less likely, as people have the ability to discern when the subjects make mistakes, unlike the app. The results of the study could still be due to third or confounding variables, such as the determination of each individual person to lose the weight. The study’s design as a randomized control trial, however, certainly makes this less likely, as participants in one category are probably no more likely to be more determined than another due to their random divisions. Another possible problem in the study could be found in the relatively small sample size of only 365 participants. This study seems to be one of the first of its kind, although its likely that other studies in the field may have suffered from the file drawer problem, especially due to the negative nature of the results. Previous studies may have held off on being published due to their similarly negative results. Further studies, or meta analyses, of this one could be conducted, and probably should, to verify if this study does in fact hold true. A possible improvement could be made by adding more participants to the study to get a larger sample-size, and thus a clearer picture. For now though, there seems to be no reason to rely on weight loss apps to support you on your weight loss journey. The study provided in this blog is very well done and has convincing evidence. I never saw these apps as being effective in terms of actually causing weight loss. However I could see them serving as a helpful tool for people trying to track their daily calories or total walking distance. 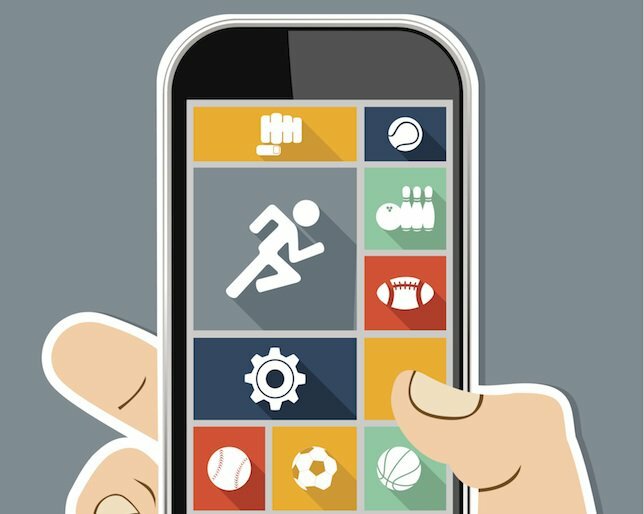 An article from GottaBeMobile ranked the top weight loss apps based on criteria such as food logging, activity and motivation. What I thought was interesting is that they claim the most successful apps are ones that track calorie consumption throughout the day. Here is a link for further reading on this article. This blog post is very relevant to the current modern day world we live in. I usually find myself looking on the health tracker on my own i-Phone and feeling accomplished when I see that I have walked over 10 miles around the Penn State campus day to day. This often is the main reasoning behind my readiness to not ever step foot in the gym! However, this article had me thinking as to how the weight loss apps could even promote healthy living when technology is one of the leading factors that attributes to obesity in our country. In an article I retrieved from LIVESTRONG, it reports that in children specifically, the growing technology presence in society is increasingly affecting the weight, diet, sleep, and amount of activity in young people’s lives. I have attached the article below.